As an uncontrollable wildfire turned the California town of Paradise to ash, air pollution researcher Keith Bein knew he had to act fast: little is known about toxic chemicals released when a whole town burns and the wind would soon blow away evidence. After driving close to 100 miles to Paradise from his laboratory at the University of California – Davis, he was refused entrance under rules that allow first responders and journalists – but not public health researchers – to cross police lines. Fires, like the one in Paradise last November, burn thousands of pounds of wiring, plastic pipes and building materials, leaving dangerous chemicals in the air, soil and water. Lead paint, burned asbestos and even melted refrigerators from tens of thousands of households only add to the danger, public health experts say. “Everything that we’re doing, it feels like this is a question nobody has asked before, and we have no answers,” said Irva Hertz-Picciotto, director of the Environmental Health Sciences Center at U.C. Davis. Researchers are examining soil tested for the presence of chemical compounds in neighborhoods destroyed by the 2017 wildfire that swept into Santa Rosa, located in California’s Sonoma County north of the Bay Area, and comparing it to uninhabited land nearby where only trees had burned, Hertz-Picciotto said. In that ongoing study, researchers found nearly 2,000 more chemical compounds in the soil than in uninhabited parkland nearby. 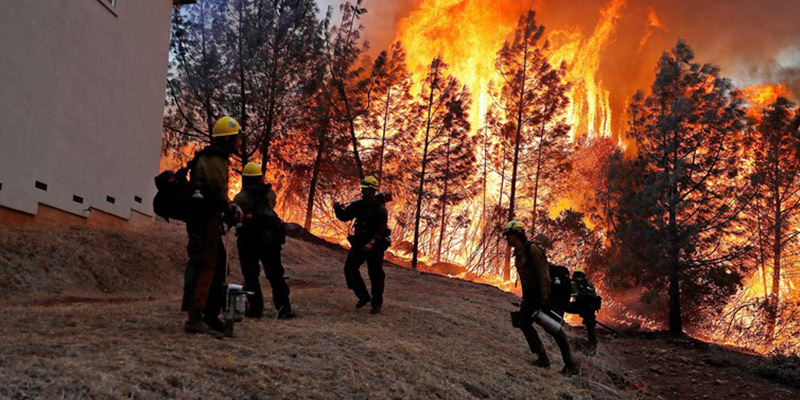 While scientists have studied wildfires for decades — learning much about the impact on air, soil and nearby ecosystems — fires that race from the forest into large urban communities were, until recently, exceedingly rare. As natural disasters increase in scope and frequency, public health researchers across the United States are developing new lines of inquiry with unusual speed. Scientists, many of them funded by the National Institute of Environmental Health Sciences (NIEHS), are studying pregnant women exposed to polluted air and water after Hurricane Harvey hit Houston in 2017; residents of Puerto Rico forced to live in unrepaired homes where mold and fungi grew after Hurricane Maria in 2017; eggs from backyard chickens that ate California wildfire ash, among other topics. “It’s fundamentally critical that we be able to understand these situations and the risks to populations both in the short term and in the long term,” said NIEHS senior medical adviser Aubrey Miller, who is helping to develop quick-response disaster research cutting across scientific specialties. To do that, NIEH has sped up the time it needs to fund research, from months or years to as little as 120 days, said Gwen Collman, who directs the agency’s work with outside researchers. “In an urban fire you’re dealing with contaminants that don’t go away – arsenic, heavy metals, copper, lead, transformer fluid, brake fluid, fire retardant,” said veterinarian Maurice Pitesky, who is leading the study. Any contaminants found in the eggs could stem from other factors such as the proximity of the home to a factory, a waste disposal site or a highway, he said. In an as-yet-uncompleted study, researchers have tested eggs sent by individual owners of roughly 350 backyard properties concerned about possible contamination from wildfires and other causes, researcher Todd Kelman said. The locations of the yards were mapped to see which homeowners lived near wildfire areas, and the eggs were tested to see if they have high levels of contaminants such as lead, cadmium and other chemicals associated with human buildings and activities. Teams from the U.S. Environmental Protection Agency in white hazmat suits combed through Paradise, loading seared paint cans, partially melted pesticide containers and the remains of propane tanks onto trucks to be hauled away. Rusty Harris Bishop, a toxics expert with the EPA who worked on the Paradise cleanup, said removal teams take away whatever contaminants they find, including melted pipes or asbestos-laden construction materials, going beyond the older definition of hazardous household waste but cleanup protocols after such disasters are going to have to evolve along with the public health science to ensure public safety, even after the literal “Fires” are out.